Hi, I am interested in your 1990 Ferrari Mondial T Cabriolet (stock #136375) listed on Autotrader for $55,900. I'd like to get more information about this vehicle and confirm its availability. 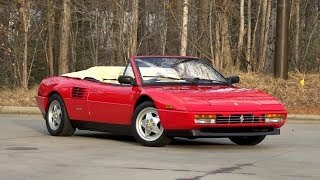 11,689 actual mile Mondial T Cabriolet 3.4 Liter V8 5 speed Manual A/C /// Its no secret that the Mondial is one of the most controversial Ferraris ever produced, and much of that lore is built around the cars unique Pininfarina-penned profile. Ferrari wanted a more practical successor to the 308 GT4 but wanted to maintain a mid-engine layout. Hence, the Mondial was born, and would eventually evolve to take the form of this awesome T. The Ts radical appeal is enhanced by blocky, retro bodywork thats pierced by aggressive louvers, led by a classic Ferrari grille and capped with predictable round taillights. And in the case of this Mondial T, which has only traveled 11,689 miles, those distinctly Italian lines are graced by a nearly flawless coat of Rosso Corsa pigment. Officially named Typo F119, this cabriolets 3.4 liter DOHC V8 combines a flat plane crank and dry-sump lubrication with lightweight alloy construction and Bosch Motronic engine management to create a solid 291 horsepower. That longitudinal mill kicks a hydraulic clutch, which spins a tough 5-speed transaxle that was derived from Ferraris 312T Formula 1 car. Theres a fully independent suspension thats fully driver-adjustable. Power-assisted rack-and-pinion steering was a welcome addition to the Mondials T variant. Stops are provided by power-assisted discs, which benefit from standard ABS. And in front of those brakes, attractive alloys spin 205/55ZR16 BF Goodrich g-Force Comp-2s in front of 245/50ZR16 BF Goodrich g-Force Comp-2s. Between the doors, standard bucket seats sport rich Connolly Leather hides. Between those seats, a wrapped console toggles a polished shifter in front of factory climate control. At the front of that console, a warp-free dash frames vintage telemetry. And in front of the driver, a simple steering wheel laps a familiar prancing horse. Call, click or visit www.RKMotors.com for more information.